The Pew Internet & American Life Project recently released the results of their 2013 study on social media usage among adults. It’s got some pretty interesting stats in it. 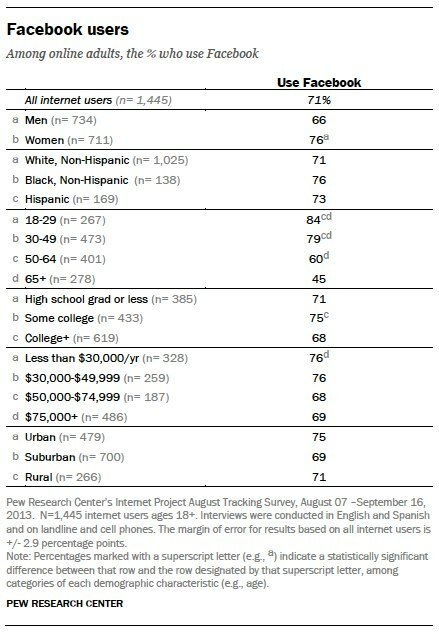 The biggest finding is that 73% of adults who use the internet also use social networks. 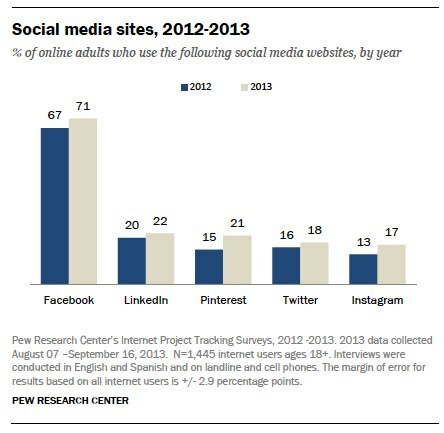 And 42% of online adults use more than one social network. That’s a huge number. What’s probably not surprising is that basically everyone uses Facebook (71%), which is up 4% over 2012. What’s really surprising is the popularity of LinkedIn. At 22%, the study found that it was the second most popular social networking site among adults. Also interesting are the demographics for LinkedIn. LinkedIn users are older, better educated, and more affluent than users of other social networking sites. 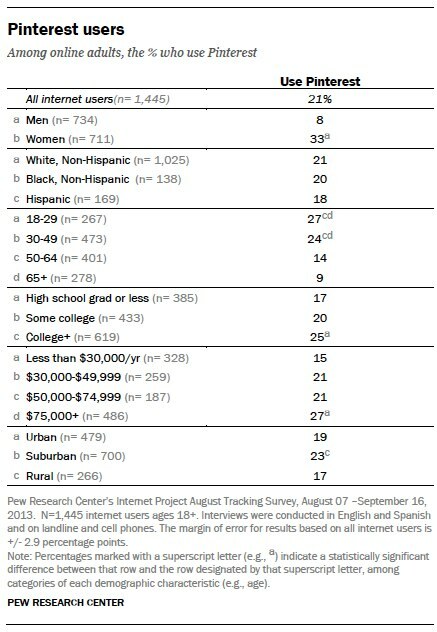 For comparison, here are the demographics for adult LinkedIn users compared to those for adult Facebook users. The last really interesting piece is the emergence of Pinterest. At 21%, Pinterest was the third most popular social networking site among adults. And it was also the fastest growing, with a 6% increase in usage over 2012. Additionally, the demographic breakdown was dramatically skewed, with women four times more likely to use Pinterest than men. And like LinkedIn, Pinterest users tend to be more affluent.